Apparently, not too holy since Medvedev didn’t serve, even though he would have been due for conscription at the zenith of the mass mobilization Soviet Army and one of the coldest points of the Cold War . Of course, there are lots of presidents who didn’t serve in their countries’ armed forces. Medvedev went on to thank Russia’s veterans with the 65th anniversary of the Great Victory fast approaching [9 May]. 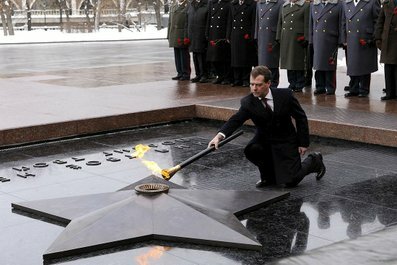 On Tuesday, Medvedev participated in reigniting the eternal flame on the grave of the unknown soldier below the Kremlin wall. The flame had been moved temporarily to Victory Park on Poklonnaya gora during the renovation of the tomb of the unknown. Medvedev also visited a military unit in the Moscow suburbs and had tea with a senior lieutenant and his family in their new apartment. The KPRF and its leader, Gennadiy Zyuganov, played the lead in presenting an opposite point of view on Defender’s Day. The KPRF faithful marched from Triumfalnaya ploshchad to Teatralnaya ploshchad for a rally. The party predicted 10,000 attendees, the police said there were 1,500, and Ekho Moskvy reported 4,000. One KPRF leader said his party was coming out in defense of the army and fleet, their history, their power and against this senseless reform which Defense Minister Anatoliy Serdyukov is conducting. He said the KPRF would hold rallies in 8 regions where elections are being held on 14 March. Those demonstrations, however, were focused on more ‘bread and butter’ issues like communal service rate increases. He continued, saying Russia has “no possibility not only to produce, but even to reform its existing military complex.” He claimed Russia is 10 years behind NATO in military potential, and he said Russia’s strategic forces are “on their last legs.” Addressing Prime Minister Putin, he asked why a minister like Serdyukov was being retained. IA Regnum reported on a rally in support of army reform and modernization led by United Russia youth wing Molodaya gvardiya and the local branch of veteran’s organization Combat Brotherhood in Ulyanovsk. Press reports said attendees were looking forward to restarting An-124 transport aircraft production at Aviastar, and having OPK enterprises serve as a locomotive for the rebirth of local industry. This entry was posted in Force Modernization, Manpower, Officer Corps and tagged Defender's Day, Dmitriy Medvedev, Gennadiy Zyuganov, KPRF. Bookmark the permalink.